In archaeology we have the concept of taphonomy. Taphonomy tells us that the ruins of the past looked very different when they were lived in. A castle would have been plastered and painted. Interior walls would be lined, painted and covered in thick drapes (think of poor old Polonius getting stabbed in the arras (always got a laugh in school)). Picture a ruined church with whitewashed walls and fresh golden thatch. The skill and science of an archaeologist is to not just see the bare bones and the stones but to clothe the past with the rich organics, textures and textiles which would have abounded then. Last week Brian Scanlon gave us a great example of the taphonomy of 20th century burial grounds. 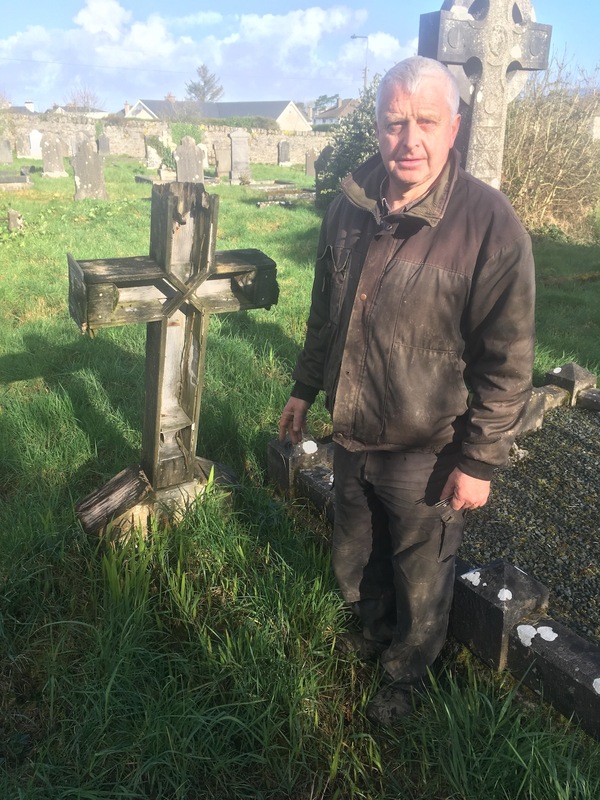 Brian is caretaker of Sligo cemetery on Cemetery Road,Sligo, and as befits this task he is also an historian. Meeting Brian in Sligo Old Cemetery he asked had I heard of a French Cross? He said there used to be 3-4 such crosses in the cemetery but there was only one now surviving in anything like good condition.The French Cross is a style of grave monument brought back from France after WW1. It is a timber cross with glass covered sections which would have held ornaments and small statues. There are not too many of these grave monuments in Irish cemeteries and this example from Sligo is going the way of all organic matter.